The flight to Bermuda was fairly easy. I arranged the flight from Albany to avoid JFK - always a good way to start a trip. In spite of the name of Albany International Airport, there are no actual flights from Albany that you would consider as international. I flew from Albany to Washington, and then to Hamilton Bermuda. Although the lovely travel site (Expedia) insisted that the plane was full when my seat was booked that turned out not to be the case. 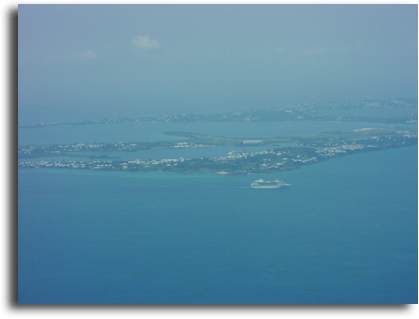 I was able to move to a window seat which allowed me to get some photographs on the way into Bermuda. 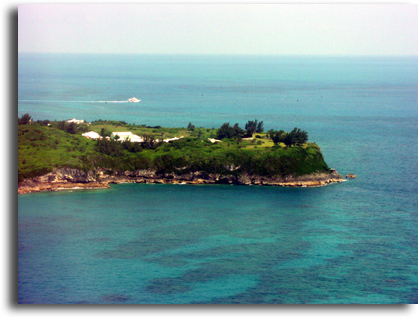 Bermuda isn't in the Caribbean, although many people think that it is. 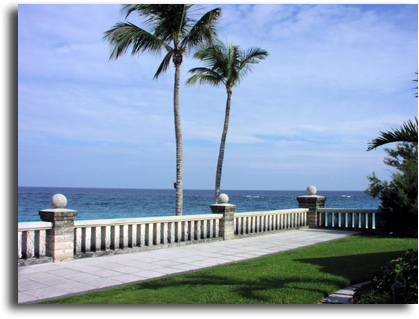 Bermuda is about 200 miles off the coast of North Carolina, in the Atlantic Ocean. 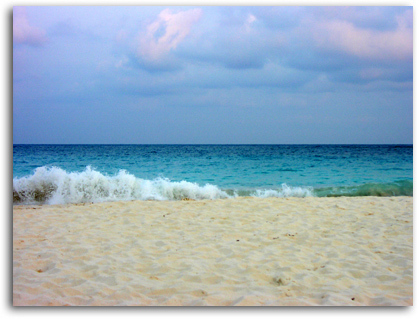 Located near the Gulf Stream current, it has a semi-tropical environment with surrounding coral reefs. Tourist season there is from roughly May to October, which is about the opposite of the prime season in the Caribbean of October to May. This photo was taken from the right side of the plane while on approach to the airport. Flying to Bermuda is a bit different than flying to Jamaica. Since Bermuda is fairly isolated in the Atlantic there isn't much to see while flying there. About 15 minutes out from the island I could start to see some color variations in the water. Closer to the island coral and other formations started to become visible, and it was easy to tell that the water was very clear. There was some haze and low clouds on the day I flew into the island, and you can see that in this photo. In the foreground is a cruise ship departing Bermuda. 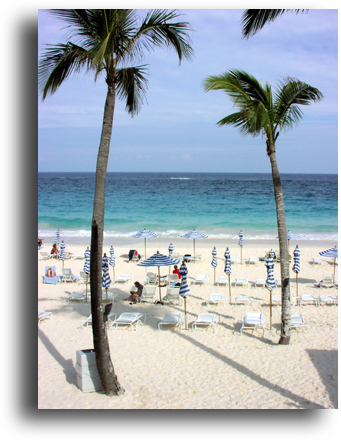 Due to its proximity to the eastern coast of the USA Bermuda is a popular cruise ship stop. Behind that is the town of Saint George. Final approach to the airport provides some nice views of the harbor and the surrounding waters. You can see how clear the water by looking at the shadows from the coral. I had hoped to spend one day of my time on the island doing some exploring and photography. I had a chance to buy a guidebook for the island before I left, and I had reviewed it to come up with some places I'd like to see. The British Navy had a shipyard and Admiralty on the island back in the 1700's and 1800's, and I had hoped to be able to get to see the museum there. The guidebook listed quite a few places that would be nice to see. The original plan was to fly in on Tuesday, work Wednesday - Friday, and fly back out on Saturday. With that in mind I had an early flight from Albany, allowing me to arrive in Bermuda about 1PM. I thought I'd check in at the hotel and then go exploring. The day was a bit cloudy (which you can't really tell from these photographs), but it looked like a nice day to be out. Once through customs (an easy affair if you answer the question correctly - Purpose of visit? Vacation.) it was easy to get a taxi to the resort. Outside the baggage pickup area there is a line of taxis waiting. Tell them what hotel you are staying at and off you go. Other options would be a shuttle bus if the hotel is running one. An option that is NOT available is rental cars - you can't. Unless you live in Bermuda the only thing you are allowed to rent is a moped / scooter thing. It looked fun to ride around, but perhaps a bit impractical with luggage. Elbow Beach is on the south shore of the island. The taxi ride is about 30 to 45 minutes long depending on the traffic and time of day. There is one road out from the airport, and it crosses the harbor on a narrow causeway. The ride here isn't a problem, but the roads can get a little busy near Hamilton, especially for the morning and evening "rush hour". Rush hour for Bermuda is something like a slow Saturday afternoon around here, so I wouldn't worry too much about that. The drive to the resort is quite pretty. The roads are fairly narrow, wind around quite a bit and have a few traffic circles, so it's a good thing the average tourist can't rent a car. My ride to the resort took me past the botanical gardens, and gave me some nice views of the countryside. 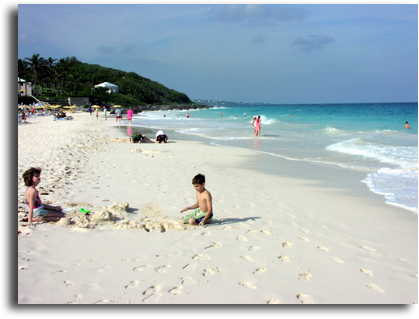 Bermuda has no running rivers or other freshwater sources. All of the freshwater on the island comes from one of three sources - rainwater collected from the roofs of buildings, some wells, and from the sea using desalination plants. Almost all of the buildings have terraced roofs that allow the collection of water. My driver told me that most houses get all of their water this way - there isn't a central water or sewage system for the island. The cab ride to the hotel took about 40 minutes, and cost slightly over $20. The taxi dropped me off at the entrance to the hotel where the bellman took my bag. 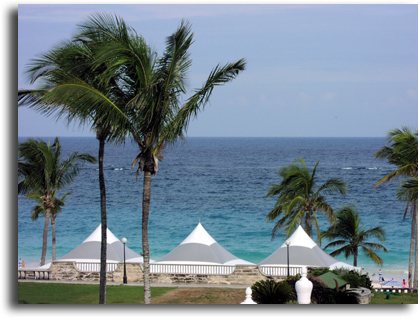 Elbow Beach Resort is on the south shore of the island. 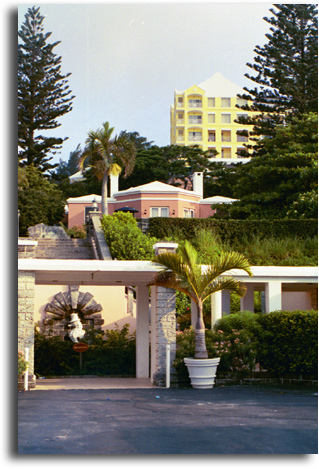 Bermuda isn't all that flat of an island, and there is a sizable hill at the resort. The main building is the yellow one in the background of the photo to the left. Down the hill from the main building are several guesthouses, with the lowest ones just above the beach level. The layout of the hotel gave great views of the ocean from the main building, but those views come with a price. It may be all downhill while you are going to the beach, but it is most definitely uphill when going back to the building from the beach, or from the treatment plant. My check in at the hotel was rather interesting. I was there on business, and the company that was installing the treatment system was taking care of the living expenses. When I got to the front desk they had no record of my name, and more ominously, no room reserved for me. 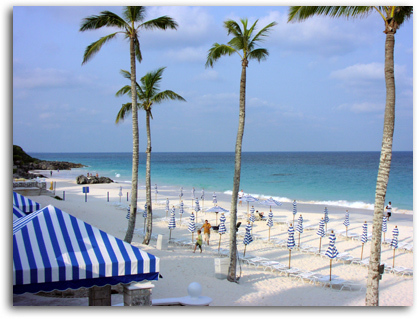 I was in Bermuda in the summer, which is the height of the tourist season, and the hotel was fully booked. After a few calls and discussions they finally decided that I was sharing a room with the representative from the other company. This was news to me, but I figured I could straighten it out later. Off we went to the room. Ever see the movie "Planes, Trains and Automobiles"? If so, remember the part where they walk into the hotel room? The room with one bed? That's what was going through my mind when I saw the room. The bellman lets me into the room, and I see one (1, as in a single) bed and a desk. The room wasn't overly large, but just for form's sake I checked around for the missing bed, of which there was none. One desk, one phone, and one bed. While I'm standing there contemplating this, the door opens and David from the other company walks in. We've only spoken on the phone before, and he is a bit surprised to see me standing in his room. Can't say I blame him there. I explain to him what they told me at the desk, and his answer was what I had hoped to hear - either they find another room or the startup can wait. Sounded fine with me, so down we went to the front desk. After some various random discussions with various random people they finally decide that they can put me into another room after all. They warn me that I'll probably be switched from one room to another on Friday, but I see that as a large trade up from the one room / one bed / two people thing. In light of the room issue at check in I expected a closet in the basement. Instead I got the room you see to the right. 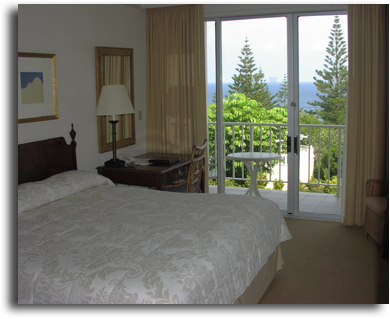 The room was a large one on the first floor, looking out towards the ocean and the pool. Through the sliding glass doors you can see two huge Norfolk Pines with the Atlantic Ocean behind them. There was a small balcony outside the doors with a table and a couple of chairs. These rather large rooms seemed to be mostly used for day conferences and meetings while I was there. The only real downside to the room was the proximity to the lounge area. It tended to be a little noisy in the evenings, but it was certainly a large step up from the one room one bed situation. I remained in the room the entire time I was at the resort, so it appeared that they weren't as booked as they thought. This is a scan of the map available at the hotel. 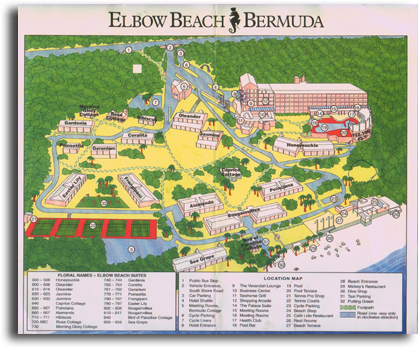 The main hotel building is in the upper right corner of the map. Below and to the right of it is the pool area. Descending down from the main building are the various outer hotel guest buildings. It's hard to read on this map, but the buildings all are named after plants or flowers - the one that runs along the beachfront is called "Sea Grapes". Just above the beach area on the left side of the map are tennis courts. Right on the beach area, on the far right side of the map, is (or, rather, was) a nice restaurant and nightclub. I've been told that this building was heavily damaged by the hurricane that hit the island in 2003, and is being completely rebuilt. If you look closely at the map you can see a circled area just above the night club, a bit over half way down on the right side of the map. That's the site of the waste treatment plant that I was here to work on. What's not shown on the map is the steep little path that leads up past the treatment plant to the backside of the hotel. It didn't seem that steep in the morning, or on the way down, but after climbing it several times during the day it started to look just a little bit like uphill. 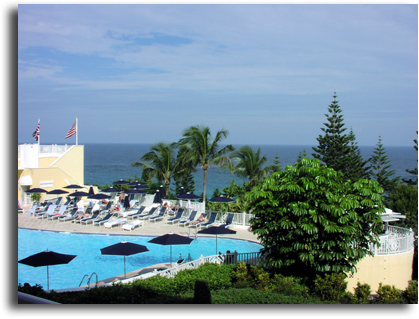 The next photo shows the pool area with the ocean behind it. The pool was very warm, and there were usually a few people relaxing by the pool in the late afternoon. Just to the left of this photo, behind the pool, is a small snack bar type of place where you could purchase drinks and light snack foods. Just below the flags were poolside rooms. To the right you can see one of the Norfolk Pine trees shooting up above the horizon. 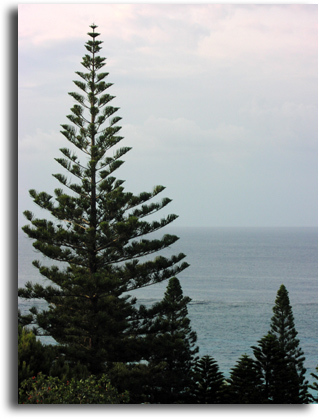 This is a shot of the Norfolk Pine with the Atlantic behind it. This was taken from my hotel room, and the base of the tree was probably a good 50 feet below the room level. These trees are surprisingly tall, and seem a little out of place on a tropical type island - usually you think of palm trees. The weather was fairly nice when I was there, although there were a few grey periods (as you can tell from this photo). Most of the time it was sunny, warm to hot and blue sky. I did switch to wearing shorts while working by the third day there - it was just too hot to wear long pants. The beach area is at the bottom of the hill. Along the beach seawall are (were?) an indoor and outdoor restaurant and nightclub. Were because they got hit pretty hard by the hurricane that hit Bermuda in 2003. I'm sure they've been rebuilt by now. 2005 update - rebuilt they were, even nicer than before. Photos coming soon! 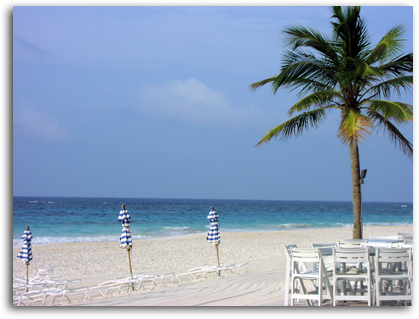 In this photo you can see some of the covered tables above the beach, with the beach and palms beyond. At the bottom of the walkway are the steps leading down to the beach. During the day you can rent beach things like boogie boards and the like. The chairs are free (at least for guests of the hotel). This is a better photo of part of the beach area. In this shot you can see the sand, several rows of beach chairs with umbrellas, and the water beyond. This, like most of my photos, was taken in the late afternoon, which explains the lack of people on the beach. The sand on the beach is a very fine pinkish color. It doesn't look pink at first, but when you catch it in the right light it's obvious. The pink comes from tiny (and I mean tiny) shells in with the sand. The sand is very, very soft - one of the softest beaches I've ever been on. The surf breaks about 10 yards out from the shore, and wasn't too large on the days I was there. I body surfed a few nights, but since the waves were so small that usually just resulted in a swim trunk full of sand. There is a reef about 100-200 yards out or so, but I didn't swim out to that. You can just see a wave breaking over the outer reef in this photo. Another photo of the beach area, this one looking out over the seawall towards the ocean. This area is to the right as you come down the hill to the beach. Farther on in this direction are the hotel's tennis courts, or so the map rumors. I was busy during the day (work, remember) and never got a chance to walk down there in the evenings. All right, so I had the chance, I was just too lazy to do it. Anyway, below the seawall is the beach itself. A bit past this point the beach turns in to a public beach area. Several of the nights there was a volley ball league playing on the beach - they looked pretty serious about it. This photo looks south along the beach. Elbow beach has a outcropping at both ends of the beach, which probably helps to retain some of the sand on the beach. It does help shelter it a bit, which makes it a nice beach for families. You can see some kids here playing in the sand, and some people walking the beach farther on in the distance. I walked the beach each night I was there - it takes about 20 minutes to do a round trip walk of the beach - longer if you wade into the water along the way. Turning around and looking north on the beach gives you this view. The beach curves around to the right, so you can't quite see the end of the beach from here. 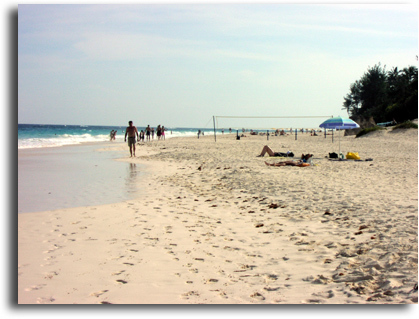 In the foreground are some volleyball nets and people relaxing in the sand. 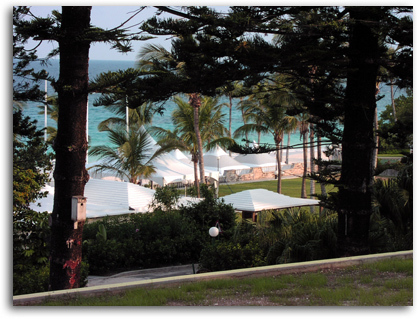 The resort's "private" portion of the beach ends about where you see the vegetation coming down from the right. Beyond the resort beach is a public beach, and then beach areas below houses and small hotels. You can see the pink shade of the sand in these photos. The beach looks even more pink at sunset. 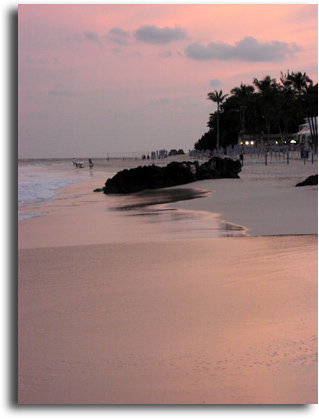 In this photo you can see the pink from the sky reflected in the water and by the sand on the beach. The beach faces southeast, so the sun sets behind you when you are looking out over the water. Sunrises are probably nice looking with the sun coming up in front of you, but it was cloudy on the morning I got up to look for the sunrise. The sun sets a bit later in the summer due to the location in the time zone and the more northerly location (vs. the Caribbean). When I was there (June) the sun set about 8:30 with another 20 minutes or so of dusk. On the same dates the sun sets at about 6:40 in Jamaica, and dusk lasts none too long. The extra time in the evening was nice for me since I was working for most of the day. There didn't seem to be too much in the way of organized events or entertainment at the resort. 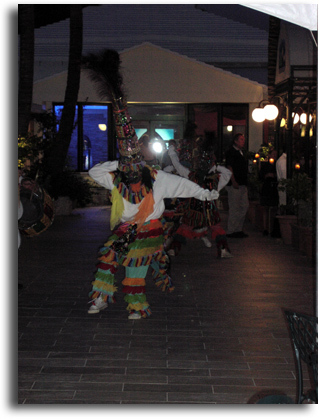 The first night I was there they had a musical / dancing group at the restaurant area by the beach. I would say native except for the fact that Bermuda was uninhabited until the English settled it. The group played drums and other such things and performed various dances. They were much cooler to watch than this description makes it sound. The other nights there didn't seem to be much going on. The nightclub was supposed to be a pretty good place to go at night, but the early mornings working put a limit on how late I was willing to stay up. Well, that, and the fact that two beers in the hotel bar came to nearly twenty bucks. The grounds of the resort were interesting to walk around. There are several walkways from the hotel at the top of the hill down to the beach. The walkways pass the various hotel buildings, and are intermixed with native plants and flowers. Most of the areas have signs labeling the plant or tree (which is how I knew what the Norfolk Pine was). 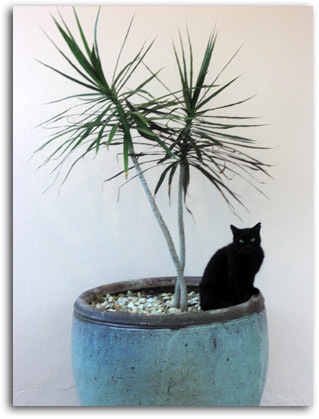 There are several cats that roam around the grounds - the black one you see here was happy to pose for me one evening. One thing I did notice was the grounds keeping - one of the days I was there the staff were out with leaf blowers and the like about 9 in the morning. I thought this was an interesting contrast to my experience at Couples in Negril, Jamacia. The grounds people were out there every morning, but you'd never see them unless you were up before 6:30 or so - they raked the grounds long before most guests got up. As nice as the resort is, I wasn't there on vacation. 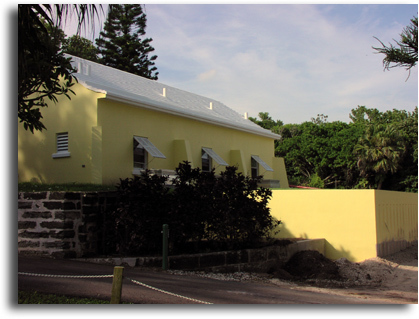 This photo shows the outside of the new treatment plant the resort was installing, which was the reason I was there. Before the treatment plant went in the wastewater from the resort was sent to the ocean with little to no treatment other than some basic settling. Some places do even less, and that's what happens in many, many places around the world. Elbow Beach resort was putting in a treatment plant without being ordered to by the government, and for that you have to commend them. The plant will take the wastewater from the resort, treat it and then use it for irrigation water for the grounds. Don't forget the Bermuda gets most of it's water from rainfall or seawater, so they aren't just going to throw away the treated water. This building is just above the beachfront restaurant. From the outside you wouldn't guess that it's a sewage treatment plant. Well, you wouldn't guess if the odor control system works properly. The plant wasn't online yet when I left, so I can't make any predictions as to that. The photo you've been waiting for - the interior of the sewage treatment plant, or at least part of it. 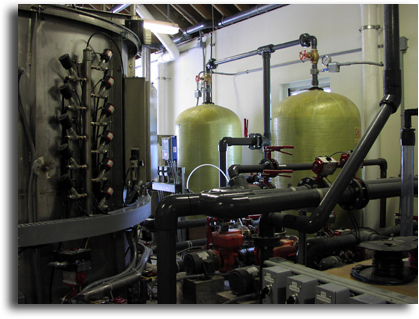 This shot shows part of the main sand filter system (to the left in the photo) and the two final activated charcoal filters. This is a view from inside the treatment plant. In the foreground you can see one of the flow meters and one of the valves for the treatment plant. 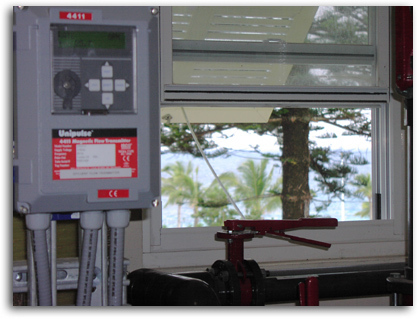 Every plant has valves and such, but not many sewage plants have a view like this out their front window! It's a bit out of focus, but you can see a large Norfolk pine outside of the window with the ocean beyond. Walking outside of the plant gives you this view of the ocean. Several of the storage tanks for the plant are underground on the beach side of the plant, and this photo shows the top of those with the beach beyond. The buildings you see above the beach are the beachfront restaurant and nightclub. This, however, was what I mostly saw in Bermuda. This is the outside of the main control panel for the treatment system. 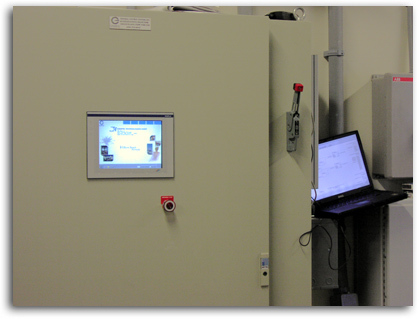 The screen on the door of the panel provides operator control and indication for the system. The computer to the right of the panel (at an angle) is my laptop that I used to program the control system. There wasn't a table (and there as barely room to stand) so the computer was lodged onto something on the wall and I stood in the way most of the time. Although there is zero chance you care, this is what one of the control screens looks like on the system (well, looked like - we added more stuff after this was taken). 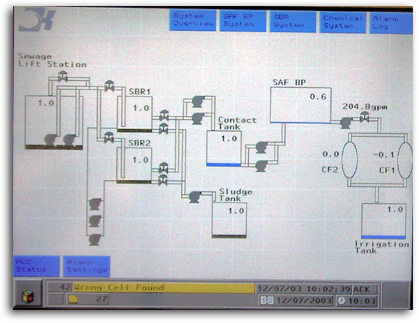 This screen shows an overview of the process with tank levels and pump status information. Raw stuff comes in on the left, gets treated by the various parts of the system, and gets stored in the irrigation tanks. If the irrigation tanks get too full the treated water overflows to the ocean. As you might be able to guess from looking at the screen, the tanks were empty when I was there, since the plant was still being commissioned. If you look closely at the screen you can see that the date and time on the computer hadn't been set yet. OK, so enough of the sewage treatment plant. We'll close out this on a high note - some more photos of the beach. This one shows part of the beach by the hotel. It's at the end of the day, so all of the umbrellas are wrapped up for the night. The same beach, looking the other direction. The beach was very nice, even if I was only able to get on it at the end of the day. One last beach photo - this one of the (rather small) surf breaking on the beach. You can see the pink in the beach sand in this photo.